The semi-arid climate we all enjoy here in the Treasure Valley requires a lot of water to keep things green! We install, upgrade, or repair sprinkler systems of all sizes and configurations. 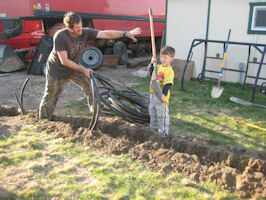 If you’re tired of dragging hoses around give us a call to solve this problem. Our pricing methods and options can put an automatic sprinkler system within reach of even very limited budgets. We don’t do weekly lawn care, but once we put your sprinkler system and landscape beds in working order we can recommend a quality local company to come and keep it spiffy for you. Winterizing: Check our pricing here. Winterize your sprinkler system every year before the first frost to ensure that there is no damage to the system. The average first frost for the Treasure Valley is October 1-10. Allowing water to remain in the pipes of your sprinkler system during winter can result in underground leaks, damaged sprinkler heads, and broken pipes. Thoroughly cleaning out your sprinkler system before the first frost is one expense you will never regret as it can guarantee the safety of your sprinkler system even in freezing weather! Choose only experienced professionals so that you can be sure the job is done right to avoid the expense of repairing a damaged system next spring. If you are not sure what type of system you have then opt for the blow out method. 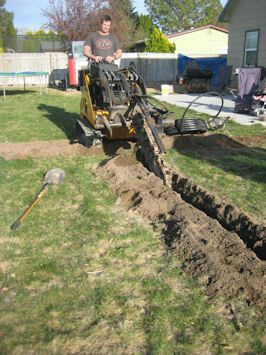 Whatever your system needs, Impact Excavating can help you properly winterize and protect your sprinkler system. 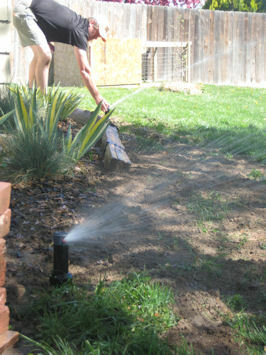 After the last frost, which is typically around May 10 in the Treasure Valley, it's time to reactivate or reconnect your sprinkler system in preparation for the growing season. There are several steps to the process of activating your system including adjusting zones, checking filters, and reprogramming controllers.